Commuters may be happy about UberHop but the president of the TTC’s union certainly isn’t. Bob Kinnear, president of the Amalgamated Transit Union Local 113, released a statement today calling UberHop a “gypsy cab” service, and accusing the city and the province of “wimping out” when it comes to shutting down the popular ride-sharing app. Kinnear ended the statement by comparing consumers’ choice of Uber over transit with anti-vaxxers: “Is it a good thing that people choose to not vaccinate their children against infectious diseases? Or is it a good thing that companies get to choose whether they obey worker health and safety laws? Why bother to even have a government if it won’t enforce its own laws?” Note: Bob Kinnear is not a doctor. As of today, Ontarians can add a six-pack to their shopping carts, as beer is being sold at select grocery store locations. “Select” is the key word here: of the 25 stores licensed to sell suds in the GTA, none are in Toronto’s downtown core. For those lucky enough to live near a beer-filled location (Loblaws is one of the key chains to have acquired a license) available brands will range from major labels (Heineken, Coors) to craft options (Flying Monkey, Amsterdam). Canadians have a reputation for being overly-nice, and today they took to the streets of Toronto to prove it. 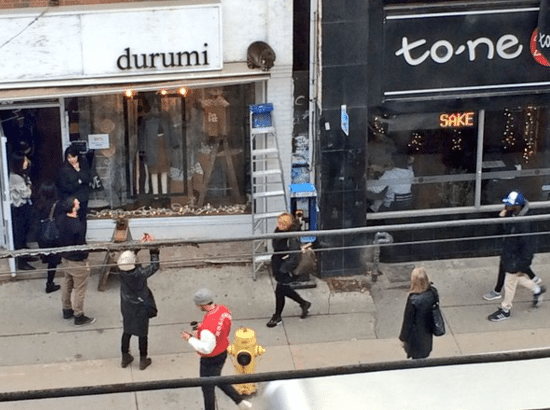 Carys Mills’ Twitter account has been keeping tabs on an on-going stranded raccoon saga that is unfolding on Queen Street West. The critter got itself stuck above fashion boutique Durumi, at which point concerned pedestrians attempted to rescue it with two different ladders and, at one point, a crate. So far the raccoon has been overwhelmed by all the attention and hasn’t returned from its second-storey perch. Somehow we think it’ll find its way down eventually (maybe once the ladder guy has given up for the day).